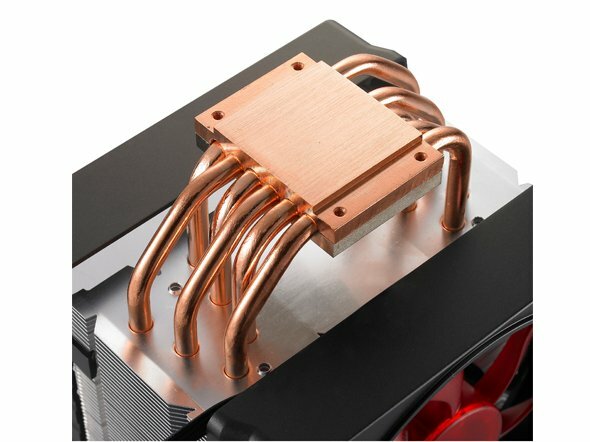 This is one CPU cooler that really PWNs! The Cooler Master V6 follows in the footsteps of the revolutionary V8 and V10 coolers. Designed with a muscular engine look, the Cooler Master V6 fits nicely with any performance hardware. The V6 also features a new mechanical structure that includes: V-shaped heatpipe array, asymmetrical aluminum fins (which are densely stacked for optimal cooling), a red LED fan with PWM speed control function, DynaLoop™ long life bearing technology, and a snap-on cover to conveniently add a second fan if needed. Pick one of these up and rev your CPU's engine!